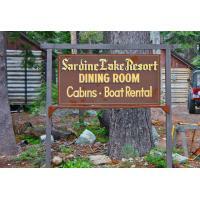 Sardine Lake Resort is a small, family run business started in 1941. 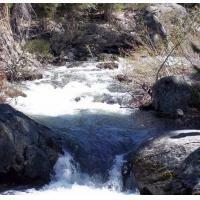 We are located on Lower Sardine Lake, at the base of the Sierra Buttes in the Lakes Basin area of the Tahoe National Forest. 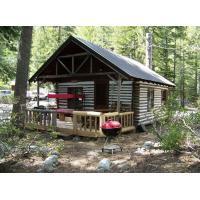 Our cabins generally rent by the week, Saturday to Saturday. Boat rentals are 12'aluminum rowboats are available by the day, 1/2 day or hourly, with or without electric trolling motors. The lake is stocked with Rainbow Trout - but you may catch an Eastern Brooke or two. 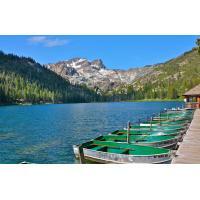 Swimming is not allowed in Lower Sardine Lake as it is designated a premium fishing lake by the County of Sierra. There is a 5MPH speed limit on the lake. Sand Pond is a famous swimming lake next door, beloved for generations. In the late 1800's, a miner's mule named Sardine tumbled into what was then called "Emerald Lake". This prompted the miners to rename the lake to "Sardine Lake". You are invited to join the many families who have become our cabin guests year after year as their children grow into our next generation of guests, sharing all the delights of a summer vacation at "the lake". Avoid the crowds and traffic of Tahoe and enjoy the peaceful rhythm of morning fishing in the mist, afternoon naps on your cabin porch, cocktails on the lake gazebo and finally settling into an extraordinary dining experience and exceptional wine offerings. The original lodge, built in the 1940's by Audrey and George Browning and later expanded adding an additional dining room in the original chinked log construction is complete with family heirloom furnishing, period lighting and memorabilia of the lodge's fishing and local history. The Browning's daughter Dorothy and her husband Chandler Hunt operated the lodge well into the 90's with their children, Janis and Tom continuing the family ownership today with the help of their fine chef Doug Walters and a very capable staff. 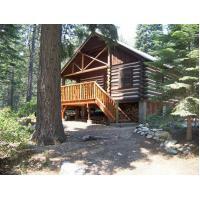 The resort includes nine, full-housekeeping log cabins ranging from one-room to our larger two-bedroom cabins. The decor is warm with comfortably updated furnishings and porch seating. Even though our typical reservations are by the week, shorter stays are likely to be available in May and October. We welcome inquiries regarding future lodging availability and frequently avail our waiting list to welcome new guests. Please call 530-862-1196 for further information. The Lodge is open daily for boat rentals, tackle & bait, refreshments, off-sale beer and cold drinks until the dinner hour. The lake gazebo opens full bar service at 5pm with dinner seatings at 6pm and 8pm by reservation (dining room is closed on Monday and Tuesday nights). 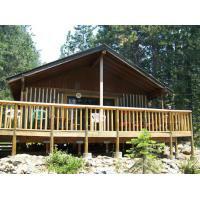 Our experienced staff can help you with suggestions for fishing, hiking and wildlife viewing. Additionally, we have a full selection of maps, guidebooks and postcards of local photography. Boat Rentals Row and motor (electric only) boats are available for rent by the day and half-day and can be reserved in advance by calling (530)862-1196. PFDs for all ages are required and provided with your boat rental.